The Entreegebied is the beating heart of the business park. It serves as a meeting point for students, employees and visitors. The mix of functions has been ne-tuned to this and includes such functions as residential, short stay, sport, o ce, catering and limited retail. The vision here is residence in a campus setting with plenty of greenery. 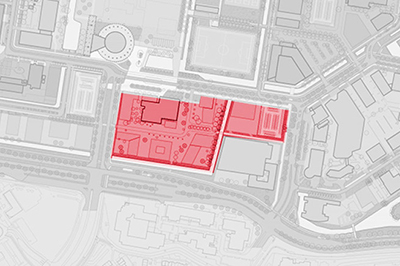 The plan encompasses central parking facilities in built multi-storey car parks above ground. Public transport links mean that the subarea is readily accessible. A master plan has been drawn up for the Entree subarea and a zoning plan has been determined. Issuance is done by Leiden University on a freehold and leasehold basis. Land prices have yet to be determined. Issuance is done by means of a public, structured tender. The land prices will be ne-tuned in consultation with Leiden municipal authority. Provision of adequate parking space for all functions in accordance with the municipal parking policy. Parking will be provided in central parking facilities to be built in the subareas Kop van Leeuwenhoek and Van Steenis. Parking standards in line with the municipal parking standards (see website of Leiden municipal authority).